George the mailman is friendly with Mr. Osgood, a lonely old man he delivers mail to. One day he sees Old Man Osgood on his back porch feeding a cute puppy leaping up and down trying to grab a dog biscuit from his wrinkled, shaky hand. Mr. Osgood sees George and calls him over. "George, look at this puppy," he says. "Do you know who he belongs to?" George never saw the dog before in his two years of walking this neighborhood. "Well," Osgood sighs, "he must belong to someone. He's a purebred." The two men stare at the puppy. "That dog," continues Osgood, "is a wire hair fox terrier that sells for $600 in pet stores. No one would let him just walk off. And yet here he is. Shows up on my back porch, nice as you please, and makes himself at home as if he was expected here, like a guest checking into an inn." George, knowing Mr. Osgood is lonely, suggests keeping the dog. For a moment, Osgood's heart leaps with joy at the suggestion of having this adorable puppy as a companion, but caution restrains him. To be on the safe side, he posts signs around the neighborhood and an ad in the paper looking for the rightful owner. Days go by but no one calls to claim ownership. So Mr. Samuel Osgood decides to keep the puppy for a while. But hesitates to name him in case the rightful owner shows up in a few weeks. Days pass and Mr. Osgood is becoming quite happy with his new little friend becoming a member of his humble home, even if only temporarily. One morning, not too long after the puppy arrived, Mr. Osgood goes to his mailbox to pick up the mail. As he reaches into the mailbox he feels a sharp pain in his chest and collapses. George sees him and rushes over, but instinctively knows that Mr. Osgood has passed on to a better world. A peaceful, satisfying smile rests on the old man's face. George dashes into the house to call the ambulance. That's when he spies the puppy who had witnessed the event and is couched in a corner shivering with fear. 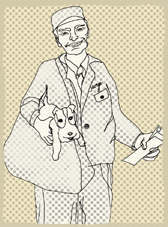 George takes pity on the puppy and brings him back to the post office. The other guys tease him about his soft-heartedness. George doesn't care. Though it's against the rules, he lets the dog sleep in the post office overnight until he can figure out what to do with him. "What's his name?" one of his coworkers asks. George considers for a moment. "I don't think Osgood gave him a name yet. He was afraid the owner would show up to claim him." Meanwhile, George takes off his jacket which has "P.O." (an abbreviation of post office) on one side and "Geo," (an abbreviation for George) on the other side and wraps the coat around the dog; it spells "PoGeo." A good name. As if reading George's mind, his coworkers yell out "PoGeo! that's his name." PoGeo becomes the unofficial post office dog who goes on rounds with George and delivers mail and postcards. He sleeps in the post office in an old Priority Mail Box cushioned with a canvas mailbag. Until the big boss from Washington D.C. visits the office and tells George PoGeo must go. But where?